Photos: Lingua Aqua by S. Doucette. Art imitates life. Public art, on a grander and more iconic scale, transcends the viewer/object relationship to include environment and the dynamic of place making. Whatever its form, public art attracts attention. 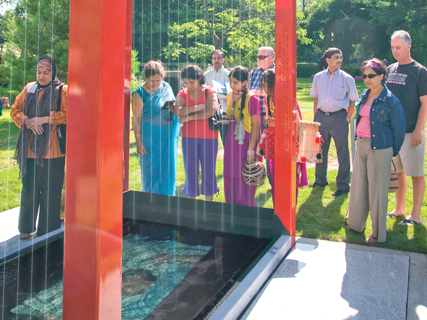 In the rapidly changing City of Surrey, British Columbia, the inclusion of language and metaphor as artistic elements from concept through to execution has produced many works of public art that serve as a unifying force to help understand cultural complexity. Although Canada is a bilingual country, the reality is that many languages thrive side by side in diverse ethnic communities. Language is not only a catalyst for the shared experiences in cultures, but is also the means whereby cultural identity is passed from one generation to the next. 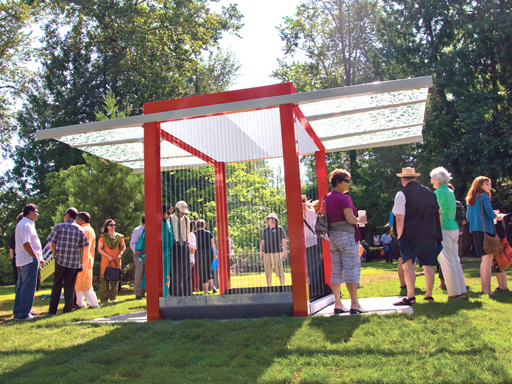 Four works in Surrey’s Public and Community Art Collection explore this theme. 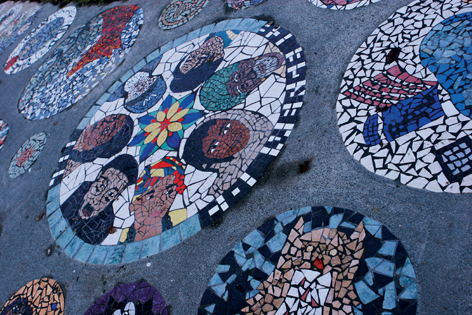 Convergence–cultures of the world living in harmony is a series of mosaics in circular shapes that contain images reflecting the diversity of the community. As part of the Community Art Matching Fund community members donated time, money and materials and also participated in creating the mosaics led by artists Connie Glover and Vallalee Hoffman. Incorporated into a pathway where people meet as they shop, go to school or work, the concept of convergence prepares us for the natural physical intermingling in the day to day lives of community members. Lingua Aqua invites us to engage with language and recall our first experiences with it long before birth. This highly technical piece that is the first of its kind in Canada is created by artists Michael Filimowicz and Melanie Cassidy. The name alludes to Lingua Franca (universal language) and provides a place to gather and enjoy a “bath of sounds”. At first glance it looks like an oriental pavilion, but upon closer inspection there are water curtains and a reflective pool containing an underwater video monitor that displays community members speaking in their native tongues. The sound of their voices emits through braille patterned speaker holes on the red pillars. Inspiration for an work called Mother Tongue/first language learned came from words in the RCMP vision statement: respect, community, compassion, responsibility, integrity, empowerment, honesty and professionalism. With a desire to capture the idea that each member of the community can claim a heritage represented by language and find ways to reach shared goals and values. Artist Elizabeth Roy designed sculptural metal versions of the words in eight languages (Chinese, Korean, Punjabi, Tagalog, Hindi, German, French and English) that crown the roof top of the RCMP building in Guildford. Poetry Rock was gifted to the people of Surrey by distinguished Korean-Canadian writer and theologian Dr. Rev. Byung Sub Van to celebrate cultural diversity and social unity. He and family members carefully selected a 40,000 pound piece of granite from a quarry on Sumas Mountain and had it transported to Bear Creek Park. He composed a poem ”Mere Water Am I” that addresses the universal and unifying theme of water in many forms. The poem is inscribed on the rock in both Korean and English and has become a contemplative place in the midst of an Asian Garden.